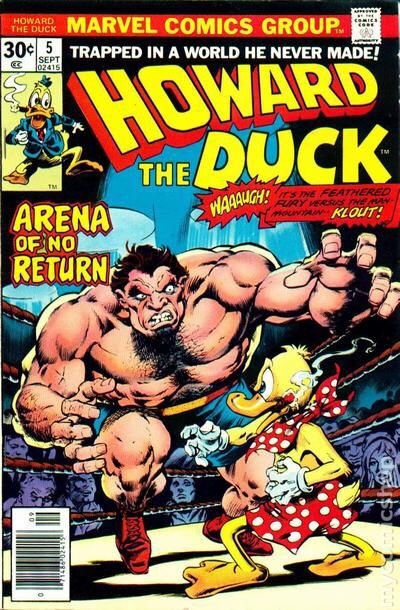 Howard the Duck is shown here taking on the man mountain known as Klout. 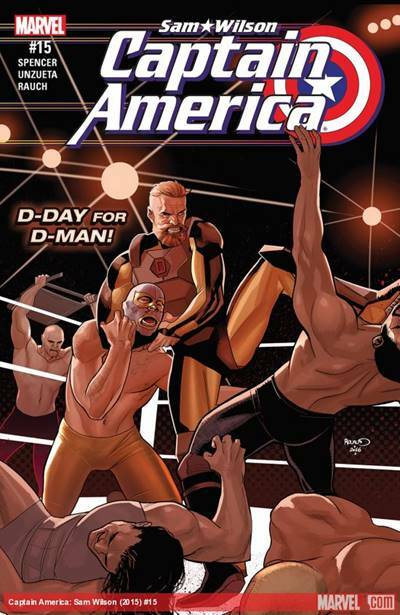 This cover comes in at number 10 not because it’s a silly looking duck in polka dot boxer shorts trying to wrestle a human, but because the artist who drew this didn’t bother to pay attention to the number of ropes a wrestling ring is supposed to have. I’ve never heard of the Zapata Brothers, but this tag team of Lucha Bros look like they rely more on heavy artillery than they do on quebradas and topes con hilo. This cover is also high (low?) on the list because it features the dreaded four sets of ropes. Another artist who decided to phone it in for this wrestling-themed cover. 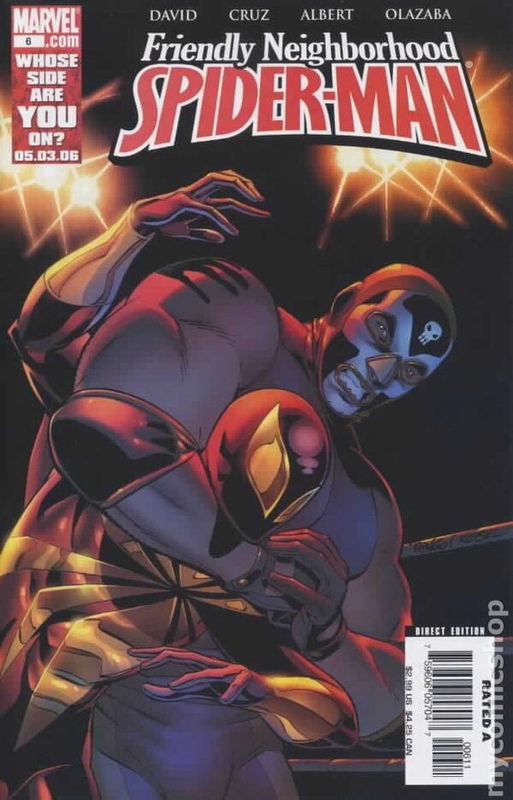 Despite their storied history, Crusher Hogan has never been selected to be on an official Spider-Man comic book cover, taking on the web slinger. 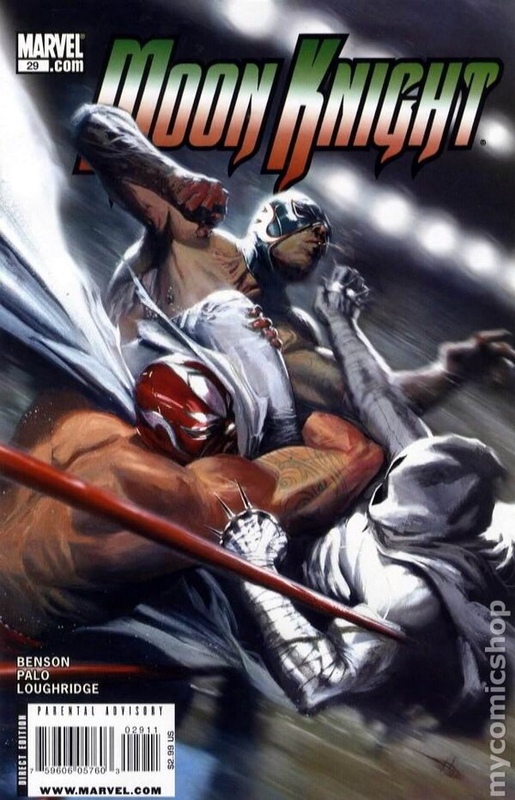 Instead, Marvel gave that honor to El Muerto, The Punisher’s chest skull come to life in the form of a masked luchador. There’s not a lot going on here. There isn’t even much of a background. It’s just a tight shot on El Muerto with Spidey in a chin lock. It’s simple and to the point. 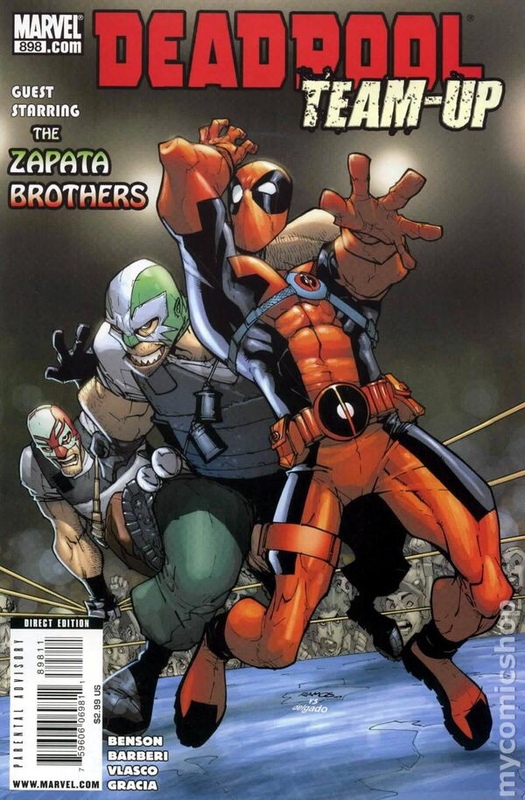 And both characters look like legit luchadores who should be headlining Arena Mexico. Demolition Dunphy is shown here channeling his inner Hulk Hogan, or Steve Austin, and taking out multiple guys at once all on his own. At least that seems to be the case in that very moment of this cover. Sure, there are two guys on the ground he’s already done away with, and two he’s in the middle of disposing of, but pro wrestling being pro wrestling, there’s a good chance he might not turn around in time before catching that steel chair to the dome. 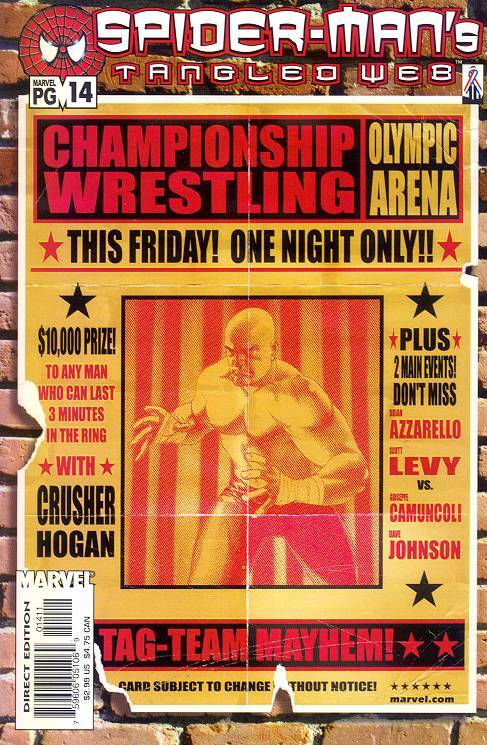 The art of the wrestling poster is an under appreciated one. And with good reason. Sometimes you’ll get posters like #2 on this list, and sometimes you’ll get a much more basic one like this one. It’s not bad, but it’s basically The Thing’s wrestling 8×10. They didn’t even care enough to add Demolition Dunphy’s picture to the poster. 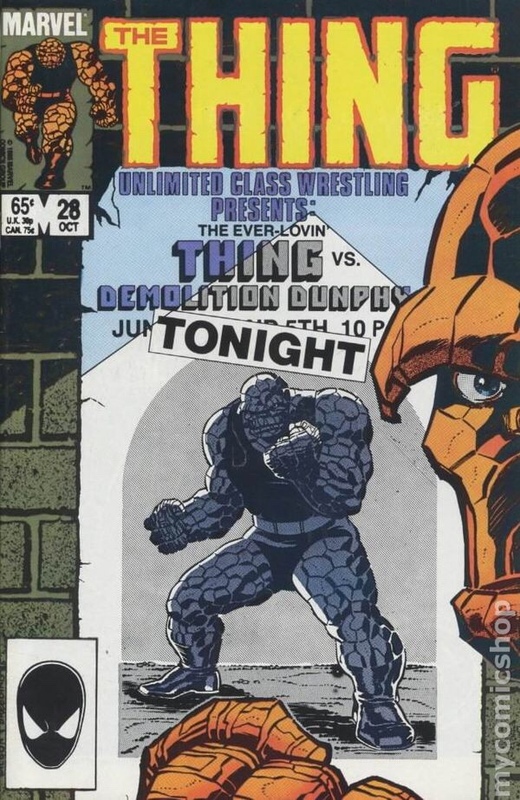 The guy The Thing is wrestling! Unlimited Class Wrestling is also betting a lot on only advertising Thing vs Dunphy and nothing else to put butts in seats. This néo-noir throwback comic book covers a lot of ground here. Dim lighting, sketchy looking mobster in a bowling hat, a gun, oh and some wrestling that for all intents and purposes is probably rigged. 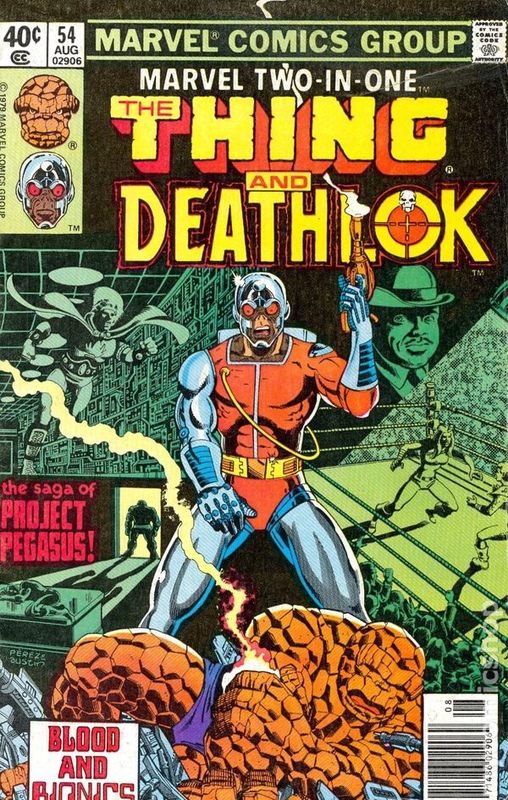 Deathlok is standing over a hurt Thing holding said gun. Which we all know is the result of The Thing refusing to throw the match at the request of the sketchy looking mobster. Probably. Not to take anything away from the rest of the covers on this list, or the artists that drew them, but this Moon Knight cover is the most artistic of the bunch. And it has luchadores doing battle. Two things that seamlessly work very well together is art and luchadores. The blurriness helps showcase just how fast everything is moving, which is a staple of lucha libre, even though these green and red luchadores (who may or may not be the Zapata Brothers) aren’t doing huracanranas and other Spanish-named wrestling holds. Despite this being a two-on-one handicap affair, notice how Moon Knight has on a pair of the most dangerous type of brass knuckles: pointy ones. Marvel characters using weapons inside the squared circle is a trend you’ll notice as the list continues. Judging by the amount of crap being thrown in the ring, and a masked luchador called El Toro Rojo, it seems safe to assume that Thor is doing a tour of Mexico. And in true lucha libre fashion, whatever Mexican wrestling promotion he’s wrestling for has him booked as the strong Asgardian heel. 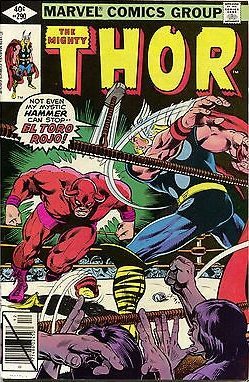 And in true heel fashion, Thor’s even using his mystic hammer to try and take down El Toro, despite it having little effect on him. El Toro Rojo is still clearly charging right at Thor, with what I’m assuming are the same type of durable soft horns that Psicosis wrestled with. But seeing how big he is, and the fact that he’s able to deflect weapons that belong to gods, it’s safe to say Toro Rojo has an even bigger problem with jobbing than Mil Mascaras. This cover is another throwback to that classic time when wrestling posters were the only way to advertise a wrestling card. A tradition that still lives on mostly in Mexico, and in some predominantly Latino neighborhoods in the Los Angeles area. This cover is a few spots ahead of The Thing (#6) cover because of the details. It’s always all in the details. You have more matches announced aside from the main event, the location of the event, and the all important disclaimer: card subject to change. Plus, the weathered and torn look is done much better here. This issue was also co-written by Scott Levy a.k.a. Raven, so it holds more weight. Like many superheroes, Cap already looks like he belongs in the the ring. And nothing is more patriotic than pro wrestling and an All-American wrestler decked out in red, white, and blue. Surprisingly, he’s not fighting a “foreign menace” wrestler, but a masked one. 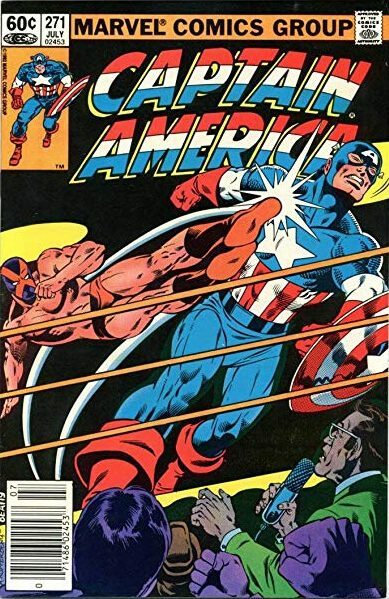 A masked wrestler who’s getting the best of Captain America despite Cap having his shield with him (an foreign American object, if you will). What’s with these Avengers guys using weapons in their matches? The masked “Mister X” isn’t just some random jabroni doing jobs on Saturday mornings, this is someone who Captain America is going to struggle against. Perhaps a villain with powers of his own. Also of note, that Gordon Solie look-a-like announcer on the bottom corner. Clearly, this was before “Mean” Gene Okerlund became the go-to prototype for all fictional wrestling ring announcers, commentators, and interviewers.